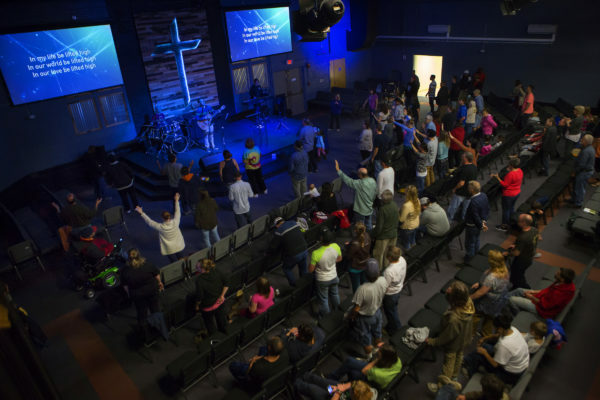 Community members pray during a City Reach Church service at the former YMCA on Hammond and Court streets in Bangor, Oct. 8, 2015. BANGOR, Maine — The church and martial arts studio now operating out of the former YMCA on Hammond Street could find themselves out on the street on April 19, a year before their leases expire. The city is threatening to condemn the building and remove the tenants, CityReach Church and Young’s MMA, if a sprinkler system is not made operational and fire safety upgrades, including the installation of a fire alarm, aren’t made by that date. 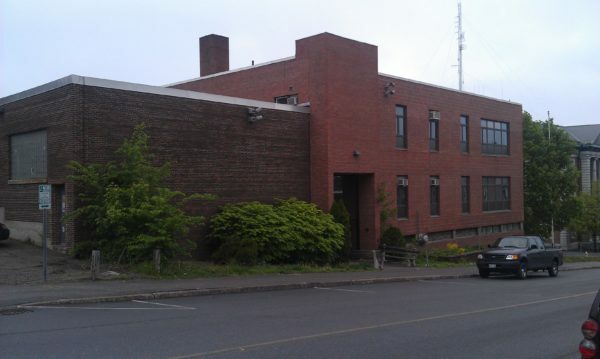 Jeremy Martin, director of the Bangor Code Enforcement Division, sent a letter dated April 5 outlining the violations to the building’s owner, 127 Hammond St., LLC, located in Bangor. He said the building was inspected March 16. A copy of the letter and the list of violations was emailed anonymously after business hours Thursday to a Bangor Daily News reporter. City Manager Cathy Conlow confirmed Friday that the documents had been sent to the owners by Martin. Earlier this month, the Penobscot County Commissioners signed a purchase and sale agreement with the owner to buy the more than 50,000 square-foot structure for $825,000 after threatening to take the building by eminent domain. Sheriff Troy Morton has proposed using the building to expand programs and relieve chronic overcrowding at the nearby jail. Church members objected to the sale and possible taking at a hearing last month. The closing to finalize the sale is scheduled to be on or before April 15. The church and martial arts studio’s leases expire on April 30, 2018. County officials said those leases would be honored when it owns the building, if code violations are corrected and they obtain current occupancy permits. Both tenants had temporary occupancy permits that have expired. Commissioner Tom Davis of Kenduskeag said Friday that he had not seen the documents but was aware that code violations had been found after an inspection was conducted in March and before commissioners signed the purchase and sale agreement earlier this month. Davis also said he did not expect the county would make repairs prior to the closing. The county would only be responsible for making renovations after the sale is finalized. Portland attorney Adam Shub, who represents the owner of the former YMCA, said his client “had been very forthcoming with the county and the city about possible code problems.” He declined to say when his client became aware there were violations but said it was before the purchase and sale agreement was signed. Both Davis and Shub said the condemnation threat would not delay or impact the sale of the building to Penobscot County. Efforts to reach the Rev. Bobby Bledsoe, CityReach pastor, or Roger Huber, the attorney representing the church, were unsuccessful Friday. In his letter, Martin described the violations as “very serious” because “they deal with protecting and warning occupants in the event of a fire.” In addition to making the sprinkler system operational, the owner must install a fire alarm system and meet other fire safety requirements for buildings that are designed for public assembly such as churches, bars, restaurants, courthouses, schools and municipal buildings. Martin also said CityReach had added a cafe to the entrance area outside its worship space and built a room outside the area described in its lease agreement. CityReach did not obtain work permits for either project or ask to have them inspected once completed, Martin said. He also said that he did not know what the estimated cost would be to address the violations. It is unlikely that county commissioners, who have a reputation for frugality, would pay to address code violations to keep the tenants in place since that work might need to be undone or done differently once the commissioners decide how the former YMCA will be used. The 127 Hammond St. LLC is owned by the estate of William Buxton. He bought the building in 2013 for a denturist school but abandoned those plans. He died in 2016. Bowman Constructors was hired by Buxton in 2013 to do some renovations on the building. The construction permit has been expired for more than 180 days, Martin said in the letter. The company has a large lien on the property but it and mortgage holder TD Bank signed off on the short sale to Penobscot County. In announcing the signing of the purchase and sale agreement, County commissioners agreed on Tuesday that there is an urgent need to ease overcrowding at the jail. They also said that before a decision is made about exactly how the former YMCA will be used, all of the county department’s space needs will be evaluated. Once that is done, an architect and a construction firm will be hired to plan and implement renovations. Morton said Tuesday that the jail, authorized to house 157 inmates, had 183 inmates with another 45 boarded out to other facilities. The sheriff has previously said that the cost of boarding inmates was expected to cost between $1 million and $1.5 million by the end of the year. The cost of building a new facility has been estimated to be between $40 million and $60 million. While an agenda for the county commissioners’ next meeting on April 11 had not been posted by 5 p.m. Friday, the condemnation threat most likely will be discussed then.